Wow! That’s so big! Do you know what plane that is? 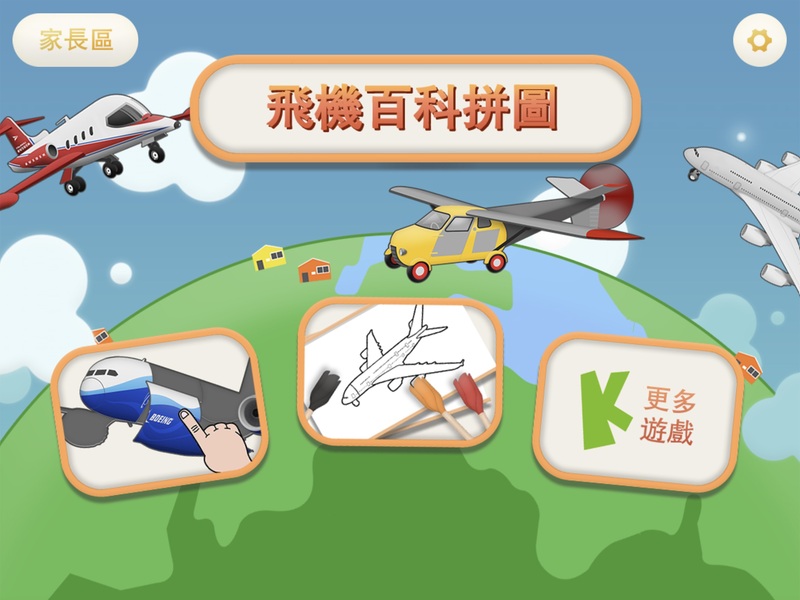 All About Aircraft Puzzle is a comprehensive teaching game for kids. 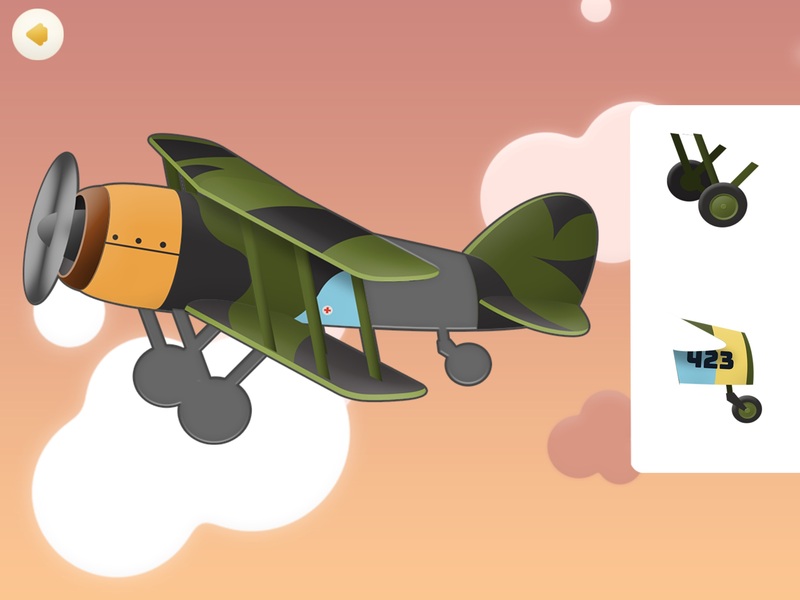 If your kids love puzzles, coloring, and who might want to know more about air planes, this is the game for them. 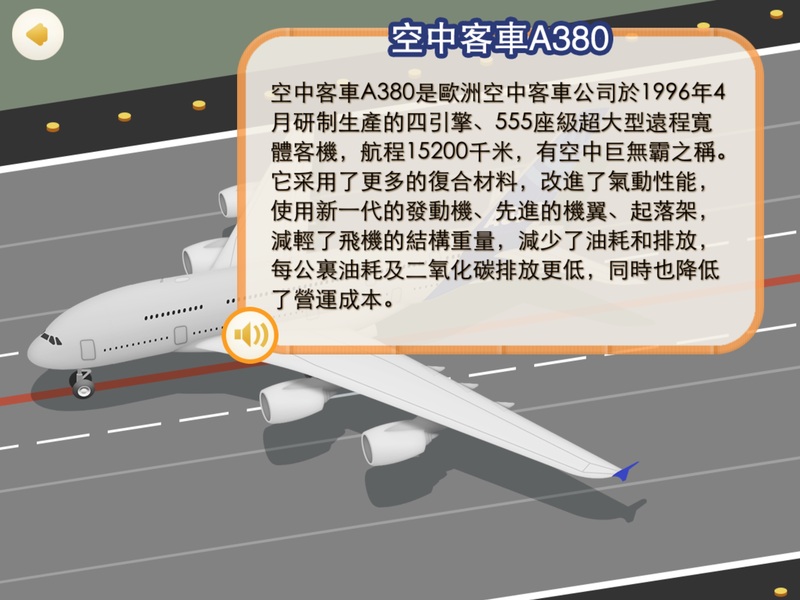 This game has a collection of 12 different kinds of plane, from Nighthawk to Airbus A380. Your children will surely enjoy it. Come on, let’s become a flight engineer, and fly to the sky! 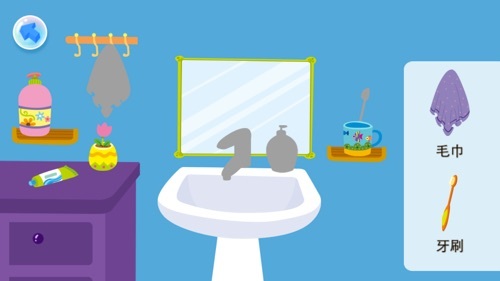 • Simple controls, developed especially for kids age 2-8. • Collection of 12 classic aircrafts. Know more about aircrafts: Boeing 787, Airbus A380, B-2 Stealth Bomber, F-14 "Tomcat" Fighter, MiG-15, Harrier Jump Jet etc. 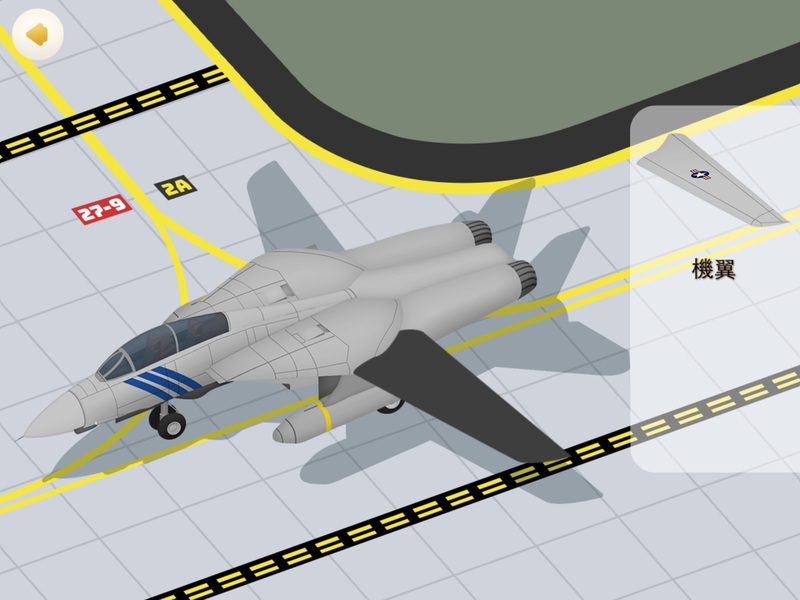 • Assembling the aircraft, for kids to learn about the structure of the aircraft within this game. 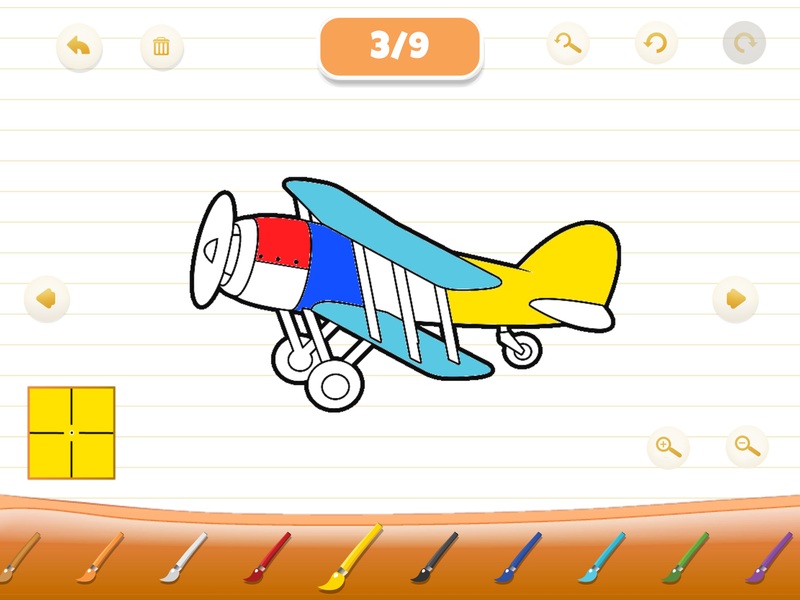 • Activating potential artistic talent in kids by aircraft coloring game, it’s so colorful. • With audio explanation on popular aircraft science, explore more stories about aircrafts. • Happy learning is encouraged by appropriate praises throughout the game. • Support with Simplified and Traditional Chinese texts. 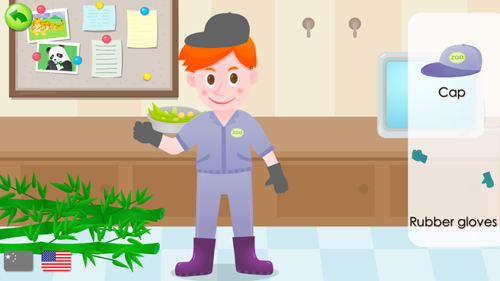 Every child has his own little career dream, and they are also curious about the different industries. "My father is a policeman. My mother can make all kinds of ice cream. How do they work on earth?" 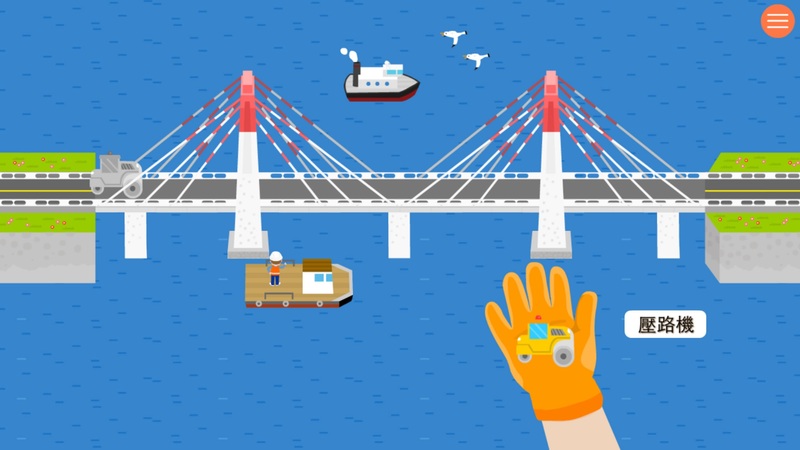 There are various career experiences related to vehicles in children's games of traffic professional experience. 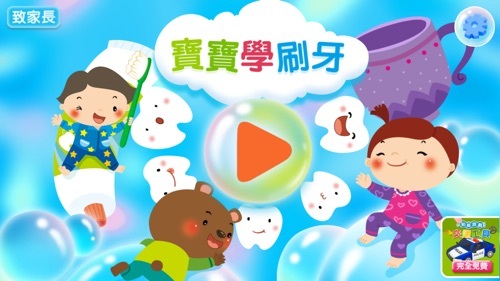 It enables children to recognize various occupations in the game, understand different occupations' names and work contents, and play super interesting role in playing games. The ice cream truck came to France and took the children to know France and complete the ice cream mission. 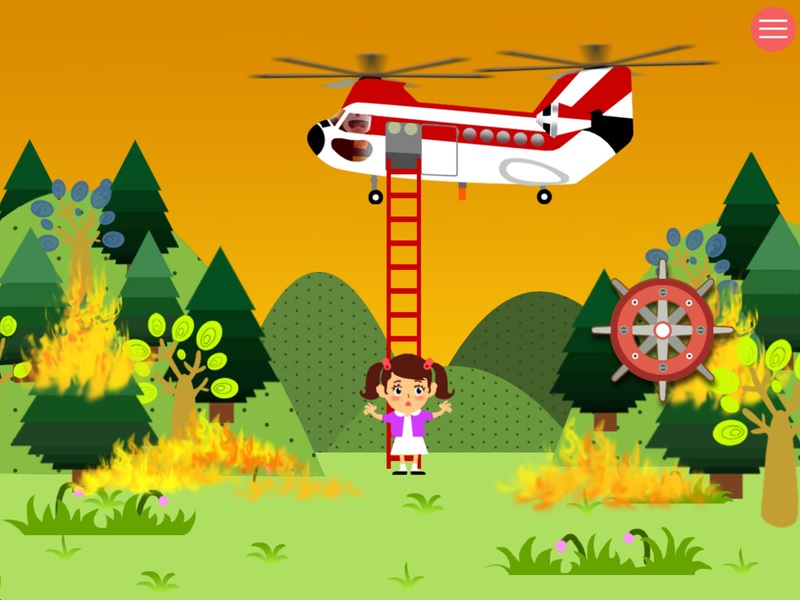 Fire rescue helicopters carry out the task of forest fire rescue. Know the structure of the crane and understand the assembly process of the playground roller coaster. - Professional role plays on the construction site for training the children observation and thinking skills. - Simple operation like jigsaw puzzle, very interesting and good for logical thinking development. - Each component is equipped with pronunciation, learning more professional words. - Happy learning is encouraged by appropriate praises throughout the game. - Support with Simplified and Traditional Chinese texts. Please pay attention! The bus is going to stop! I am the bus driver. Dear passengers, for your safety sake, please sit and stand properly. 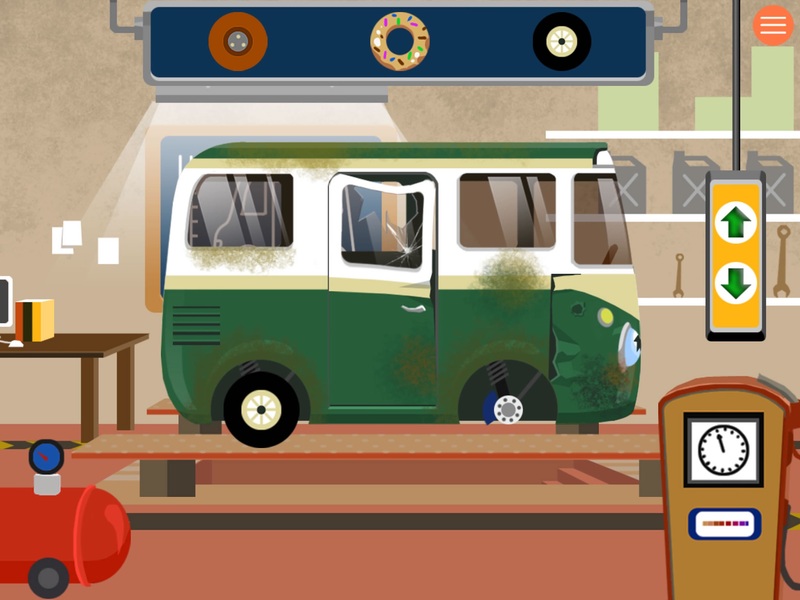 Bus Driver-Game for kids is a role-play puzzle game for kids to know more about the occupations. 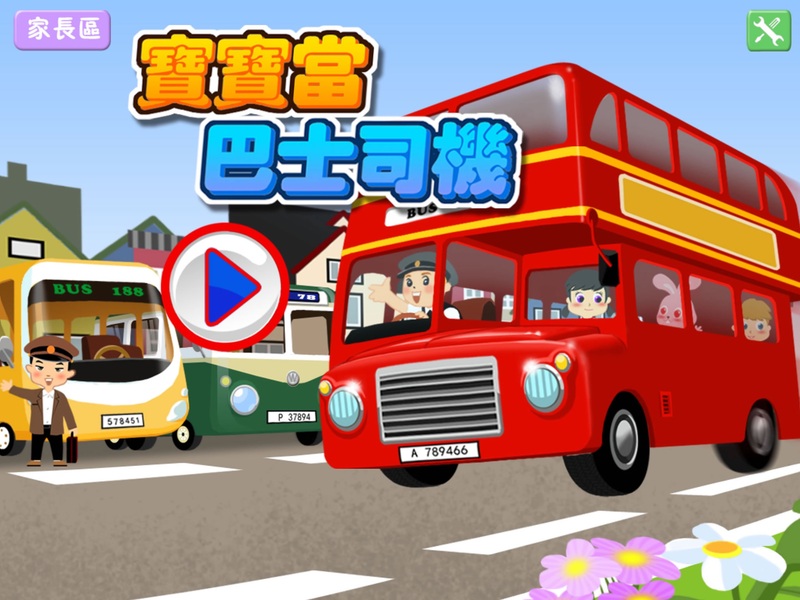 Through the game, kids can gain knowledge about various buses and transportations. In addition, kids can experience about the routine work of the bus drivers. 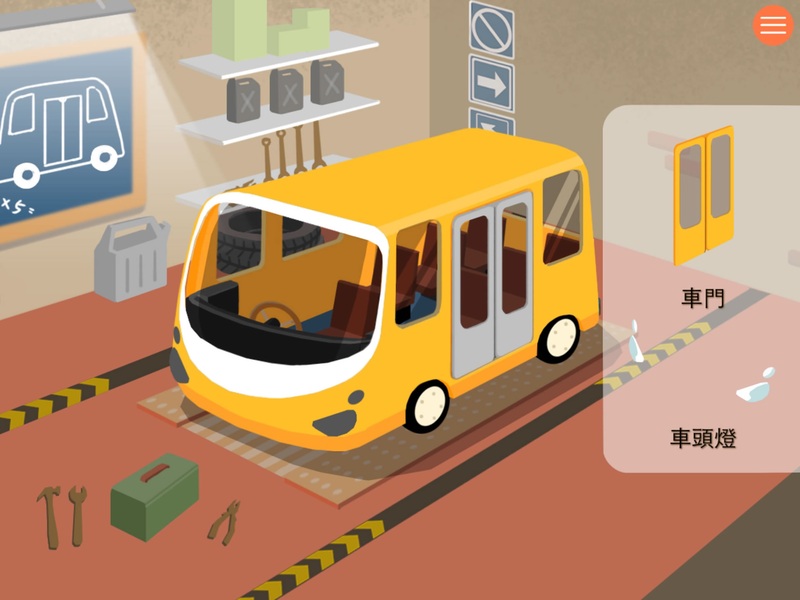 ● Kids can learn about the basic structures of the buses, the ways of maintaining and washing the buses as well. 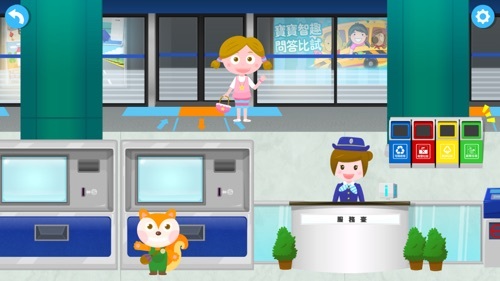 ● Kids can experience the routine work of the bus driver: for example, start to run the bus, stop the bus and let passengers get on and get off the bus safely, and arrive at the terminal etc. 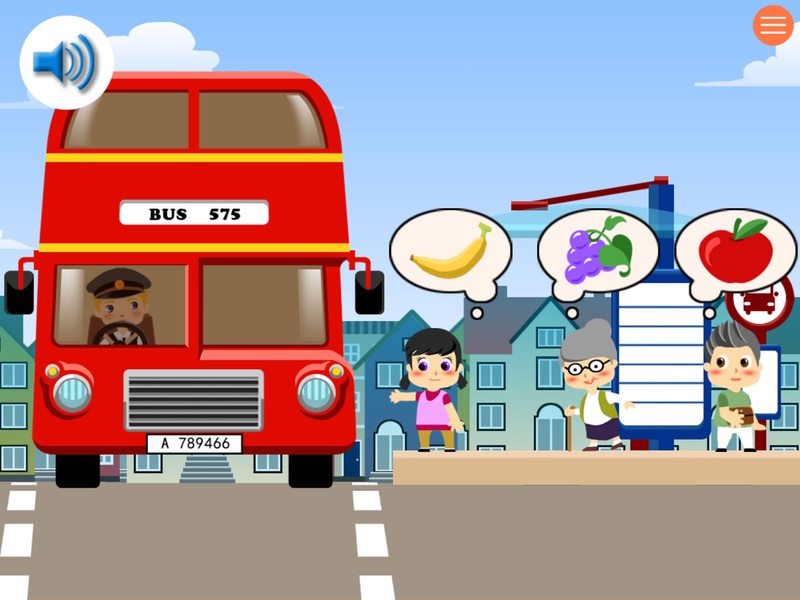 ● Kids can learn about the rules of getting on the buses. 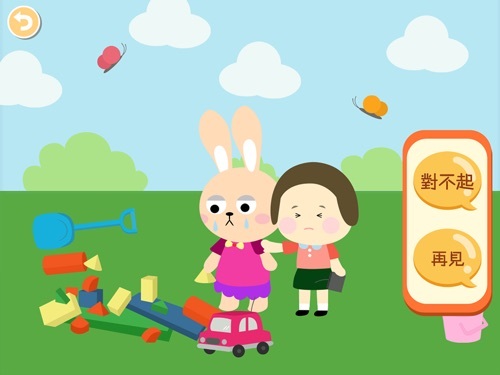 ● Kids can learn about the safety symbols and instructions so that kids may realize the importance of safety at a higher level. ● Professional role plays on the construction site for training the children observation and thinking skills. 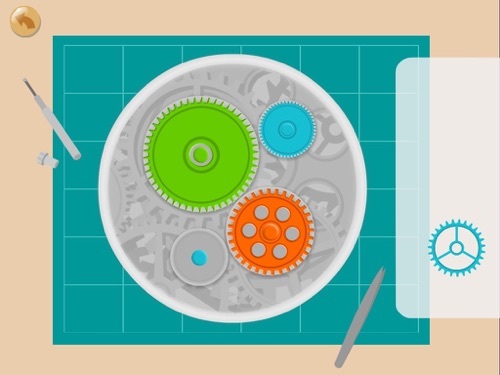 ● Simple operation like jigsaw puzzle, very interesting and good for logical thinking development. 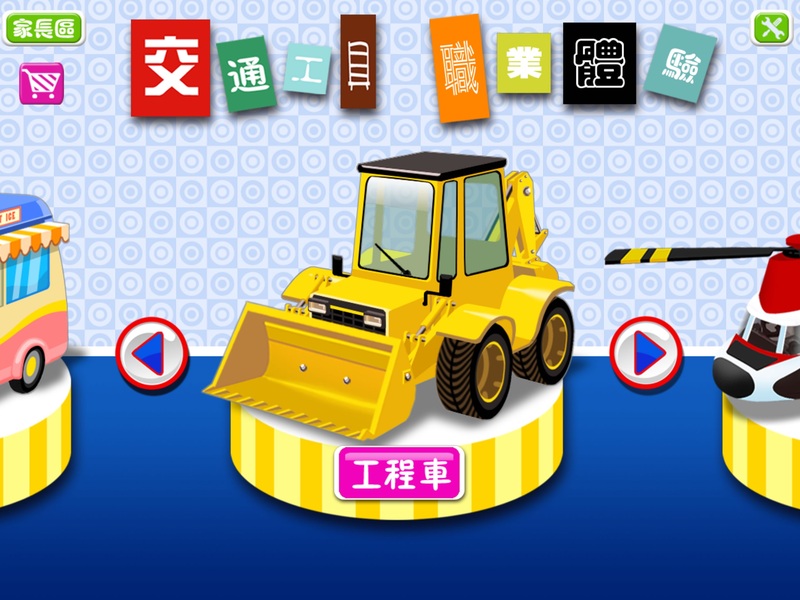 ● Each component is equipped with pronunciation, learning more professional words. ● Happy learning is encouraged by appropriate praises throughout the game. 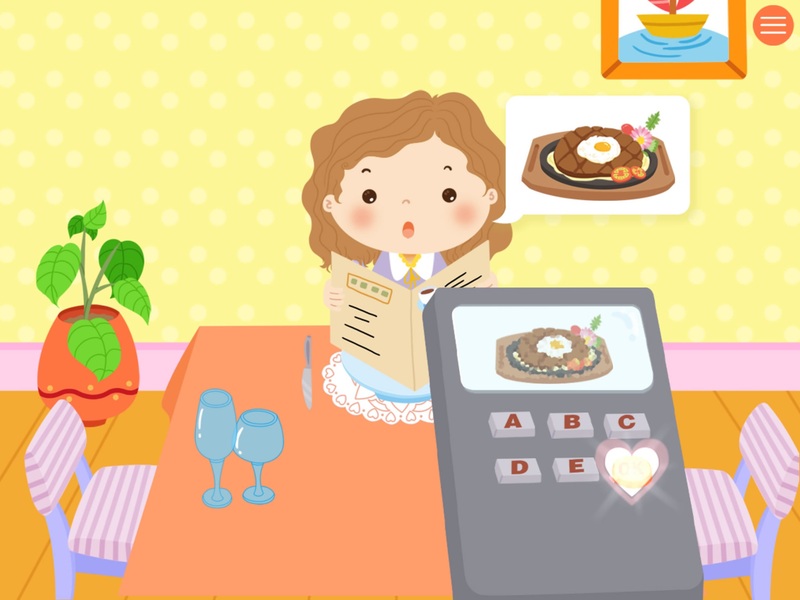 Little baby chef - restaurant is a puzzle game for children to experience being a chef, mum's good assistant, baby's best friend. It's an excellent tool for educational enlightenment! It would always be so happy and fun to follow mum and dad to go out for a big dinner! 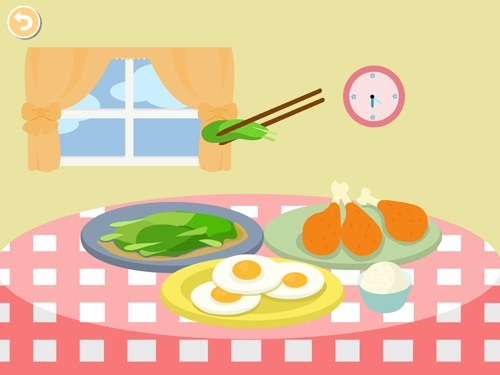 Now, even better, you have a chance to run your own restaurant, starting from designing the restaurant,preparing menu. Want to have a try? 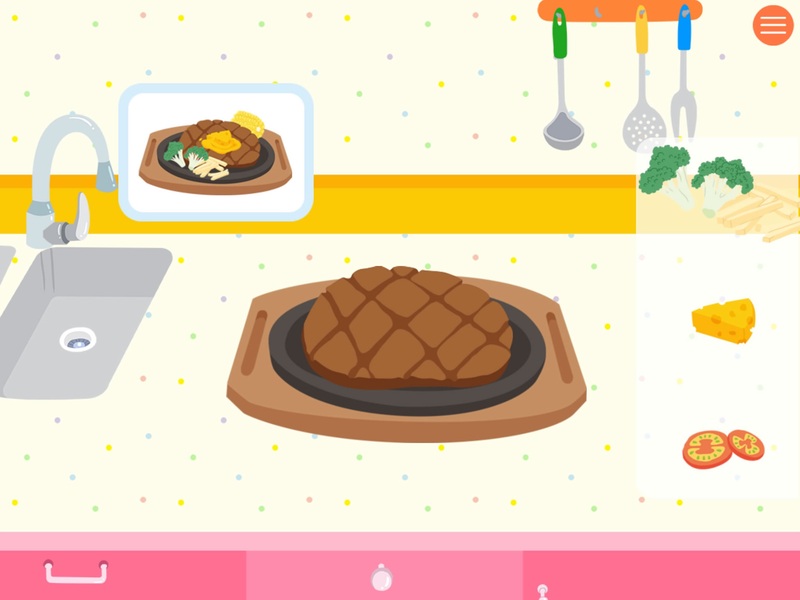 Come on, to make delicious food for the guest! 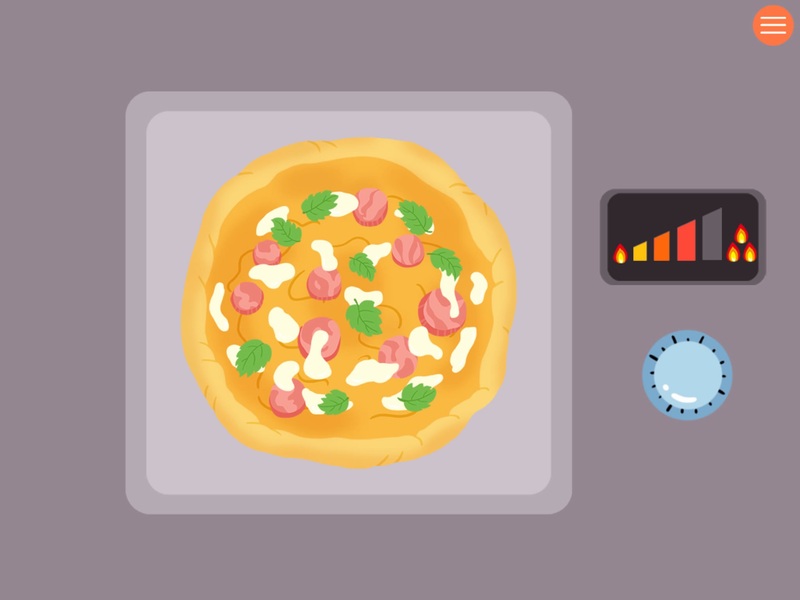 ● Understanding the operation procedures of a restaurant. 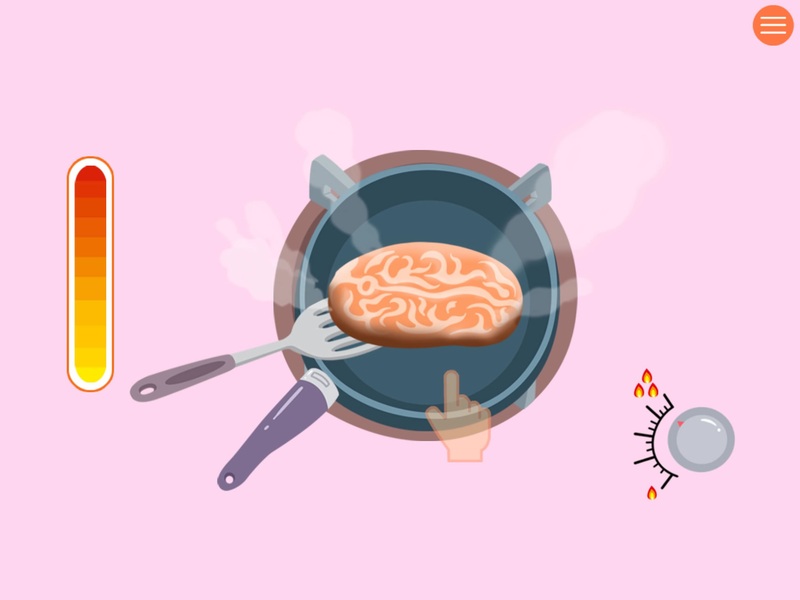 ● Colorful, high d screen stimulating your appetite and developing creative thinking. 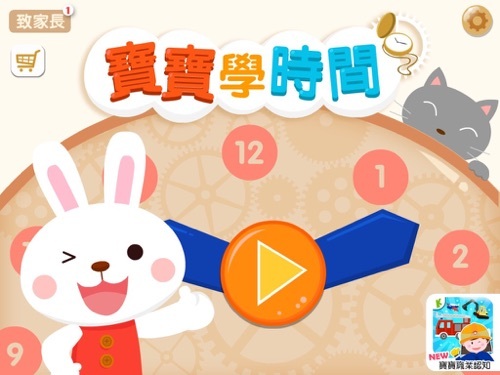 ● Name and its Chinese pronunciation are on each component of the puzzle which will allow children to learn more Chinese words and phrases. ● Happy learning encouraged by appropriate praises. Simplified and traditional display. 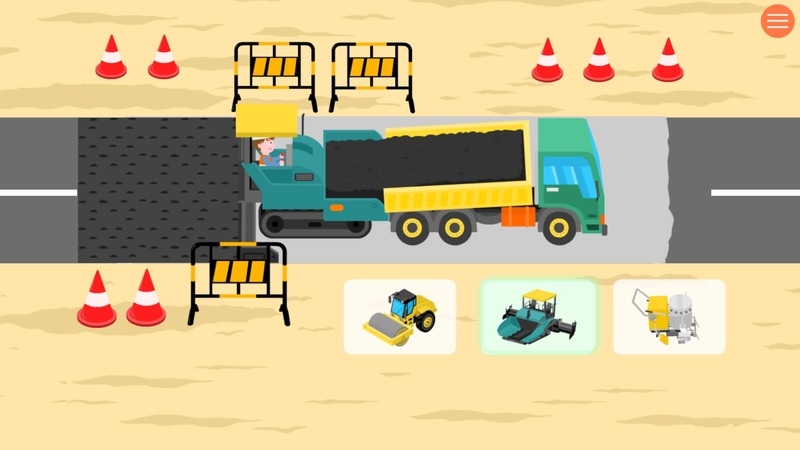 Trucks - Construction is a professional experience game for toddlers, preschoolers and kids. 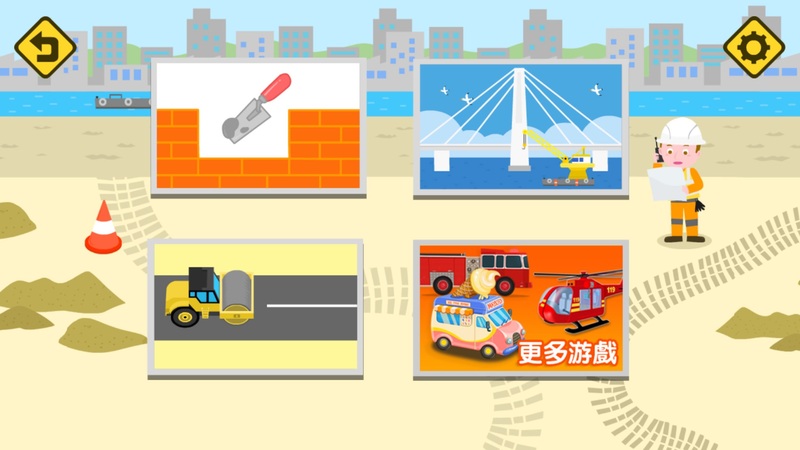 The children will experience different kinds of construction processes, knowing what machine vehicle is for digging, how a bridge is constructed, how to build a road. Such a fantastic construction site! Why waiting? Go ahead for a new start! 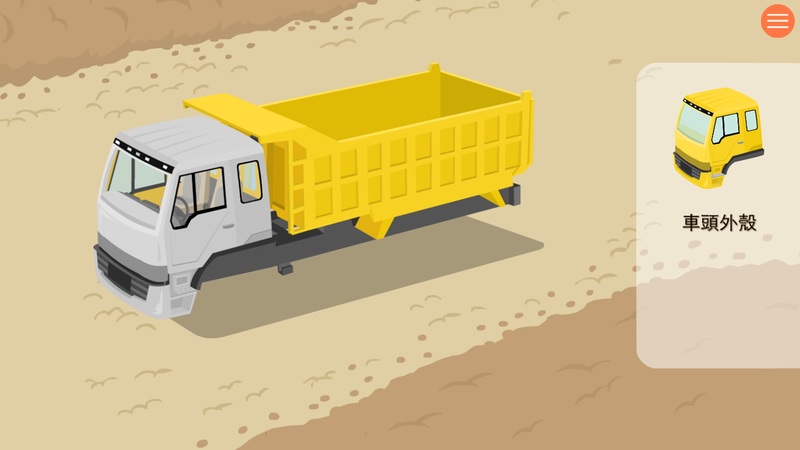 ● Different trucks structures and relevant knowledge. ● Happy learning is encouraged by appropriate praises throughout the game. ● Support with Simplified and Traditional Chinese texts. How to communicate when received the gift? How to do when guests to home? what do you say when you need some help? 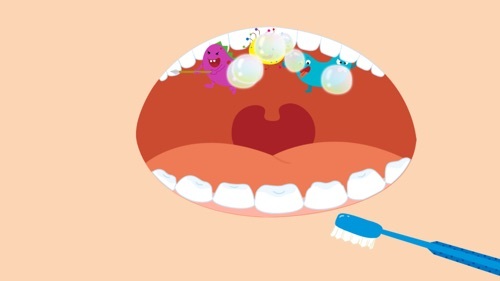 The children's game "Baby be polite" can help babies to get social skills! 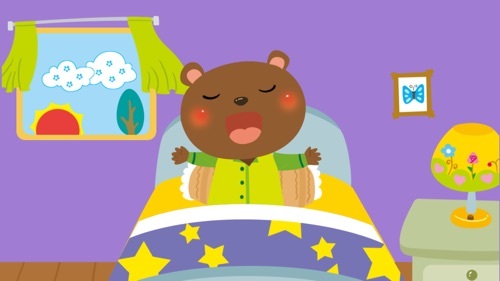 It designs multiple life scenes of daily language for the babies, with interactive games, let babies to learn language within the game, to improve their emotional intelligence and social skills. 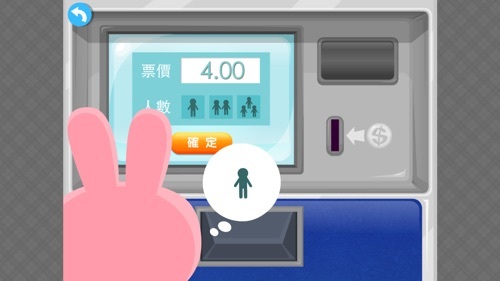 ● It includes "hello" "thank you" "please", " sorry", and other common polite expressions. 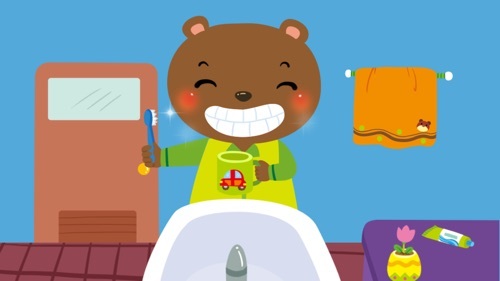 ● Kids friendly voice guide, let kids easy to learn and remember the polite words. ● Life scenes design, make kids get more good habit of polite. 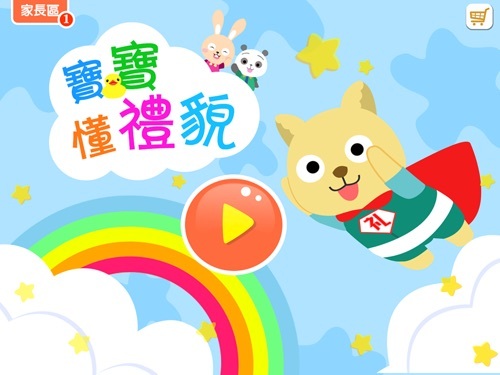 ● The operation is simple and interesting, characters are cute and kids friendly. ● It supports simplified Chinese and traditional Chinese. "Don't be late!" In order to form a good habit in daily life, learning and understanding time is crucial for kids. Kids Learning time is a game to experience how to repair clock, understand the structure of the clock and how to use digits to present time. 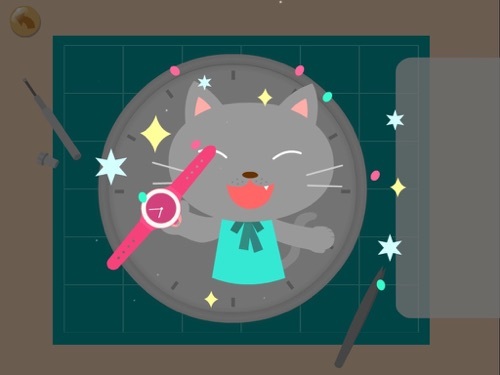 These will help kids to develop their sense of time and their future time management. ● learning the relationship between digits and time. 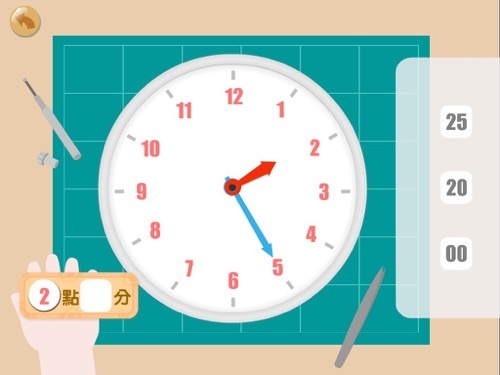 ● leaning the hands on round clock and how time is presented. ● Involving professional experience of repairing clocks and watches in order to understand the structure of the clock. ● Interactive language and music in game. 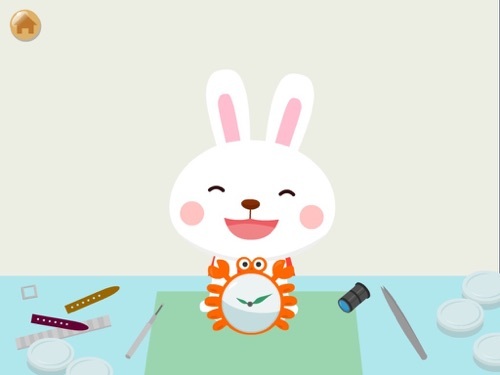 ● Simple operation and cute drawing style. ● Supporting simplified and traditional Chinese display. 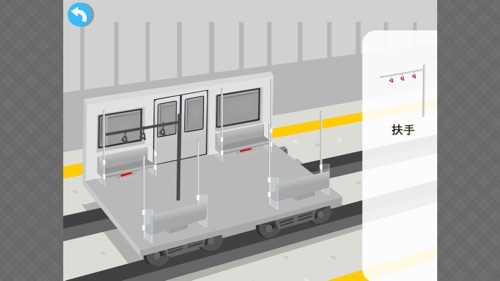 The subway is becoming such an important and efficient transportation in cities that we cannot travel without. 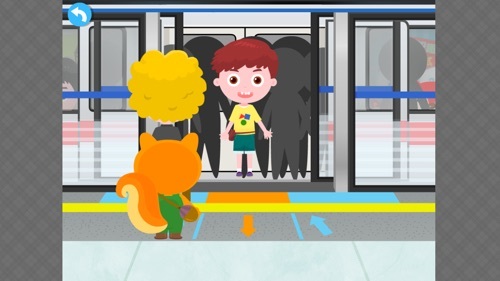 Subway Guide For Kids is a cognitive game for children. 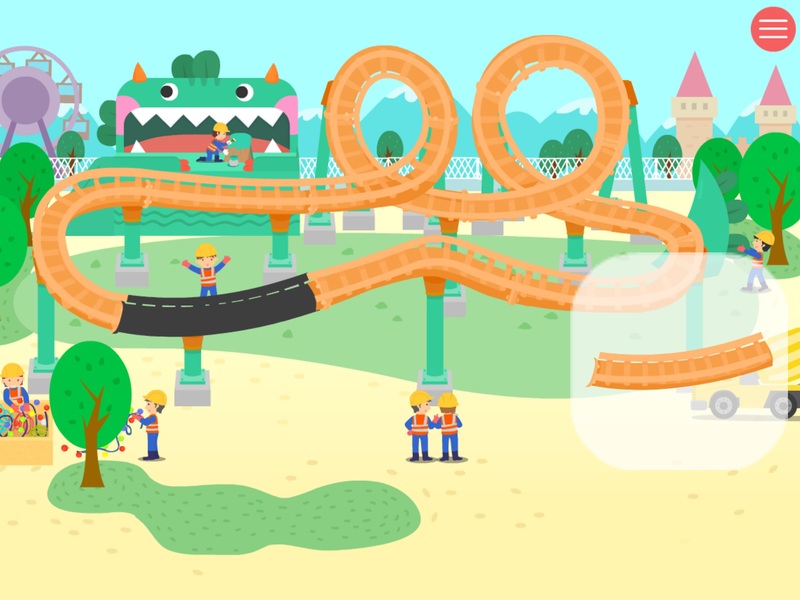 Through the games, children will learn more about train structures and how to travel by train. Woo, the train is entering the train station, let's experience the fun of traveling by trains! 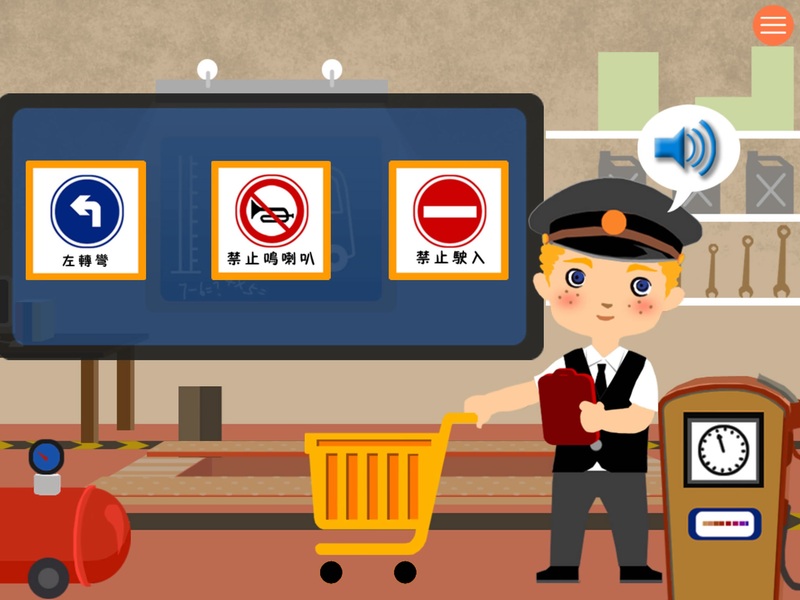 ● various little games for children to learn how to take trains and what is the structure of trains. 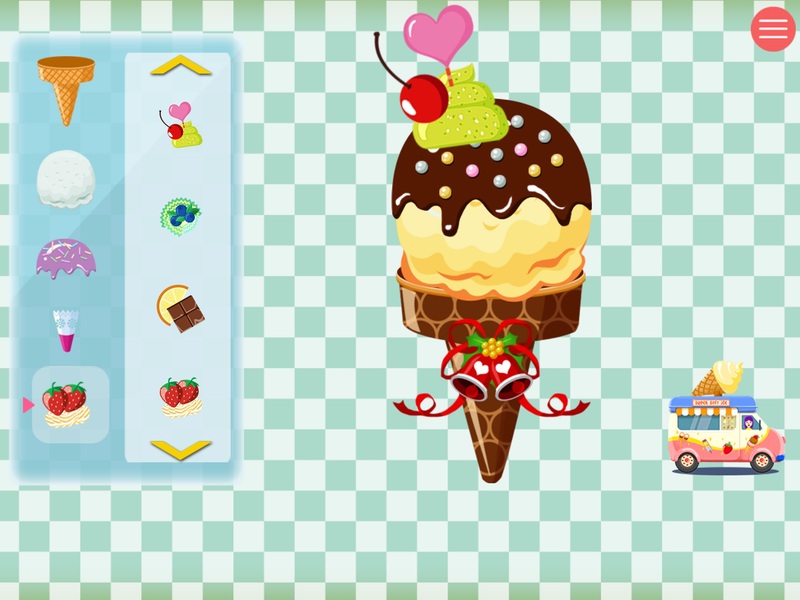 ● simple operation for different games to develop children' logical thinking. 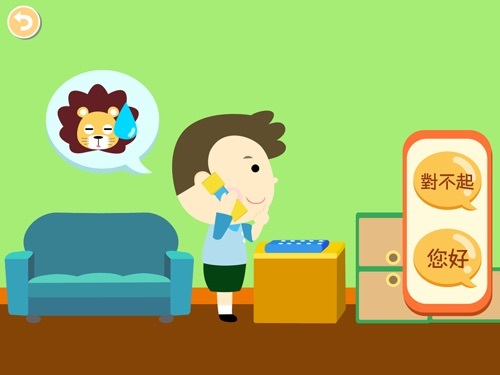 ● vocal praises are set in every aspect of the games for fun and to improve children' language skills. ● support simplified and traditional Chinese display. 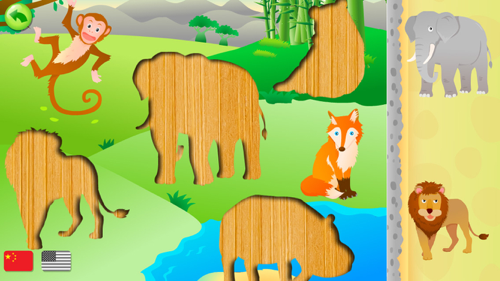 Toddler's preschool zoo animals shape jigsaw puzzles game is a designed for children in cognitive game. 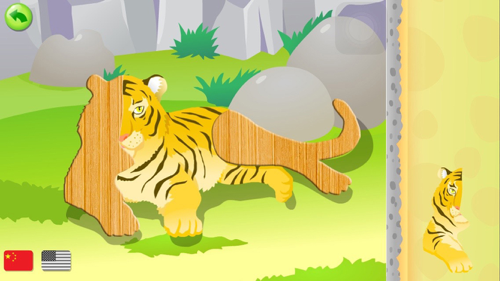 Children can through puzzle, know the zoo animals and understand the Breeder. Let the child at the same time in the game of relaxed and happy learning. ● know 12 kinds of animals and animal keepers. ● simple drag and drop function, it is easy to learn and control. 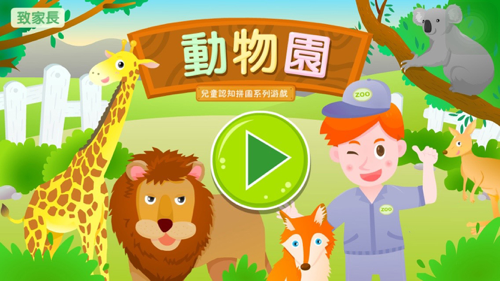 ●Every animals and objects provide Chinese and English pronunciation. 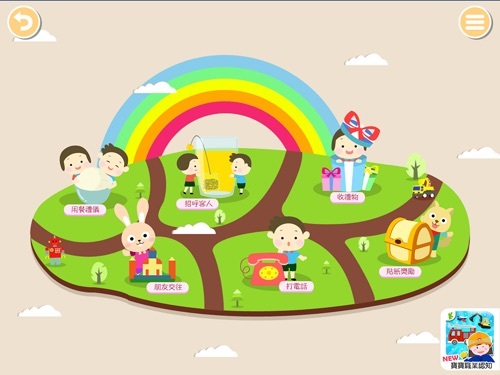 ●Easy operation, bright colors, and the baby can also independent reading and identification.